The last post was about two apologies. This week, let's consider two misunderstandings or perhaps miscalculations. North Korea against the world ... again! This situation would be somewhat humorous if not for the fact that a miscalculation or an inadvertent incident could trigger a deadly conflict. Nor is the leadership's stance at all funny when its policies of paranoia over the past several decades have reduced its population to one of the poorest and most isolated in the world. North Korea has had a new leader now for 15 months. Kim Jong-un, the youngest of three sons of the previous leader - Kim Jong-il - is in his late 20s. For several months in his new role as leader/one-to-be-worshipped, he appeared to be trying to soften his image and engage with the world - something the world was ready to embrace. Kim Jong-Un even displayed his wife in public settings, who is possibly expecting no less. 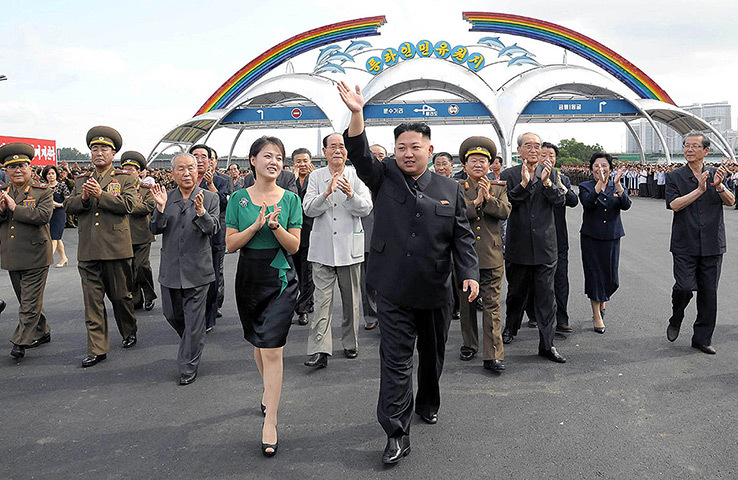 Kim Jong-un, and his wife Ri So-ju (not sure what happens to last names in North Korean marriages). Westerners do not relate well to the synchophantic displays routinely bestowed by the North Koreans on their leader. Even as Kim Jong-un made his transition and debut, North Korea's attitude towards its enemies (ie. nearly everyone) was hardening. The hostile stance was about sanctions and talks organized by its neighbors regarding the country's continued efforts to test nuclear delivery systems (missiles) and conducting underground nuclear tests. In March, 2010, the level of tension was ratcheted significantly when North Korea torpedoed a South Korean warship killing 46 sailors. But in early 2013, things escalated further. As the BBC notes, "Over the last month, Pyongyang promised to shred the 1953 armistice agreement and shut off the hotline at the border region. It then announced it had increased the combat-readiness level of its artillery forces, with targeting that it claimed would put US bases in Guam and Hawaii in the crosshairs. ... Kim Jong-un has made multiple visits to military units amid the tensions on the peninsula. Most audacious was Pyongyang's announcement that it reserves the right of pre-emptive nuclear war against Washington or Seoul. " North Korea has been harsh and bellicose with its war rhetoric, threatening the US mainland, but in fact, most analysts place Alaska in any theoretical danger. South Korea's first woman president, Park Geun-hye. Only assuming power in late February, 2013, she finds herself already in a hyper-tense situation. Where do we go - what are the calculations or assumptions being made by North Korean leadership that may become miscalculations. Russia and even China - North Korea's clear and closest ally - are uneasy with the language flowing from Kim Jong-un and his military. China especially has much to lose, due to its long border with North Korea - if chaos descends. Still most analysts continue to conclude that real military action is unlikely; North Korea must simply be positioning itself to extract as favorable conditions as possible in future talks, its military units are not being positioned along the border for imminent action. Teatree hopes that is all true, and is not a misunderstanding on the West's part. Far from North Korea, Cyprus has been in the news the past week as its revenues have run far short of its spending, and its banks's obligations extending far beyond their assets. In order to receive further financial aid from European Union members and world banks, Cyprus legislators had come up with a plan to take 10% of funds from all citizens holding money in Cypriot banks as part of a way to gather funds for debt repayment and restructuring. That did not go over well with the citizenry! Cyprus, a small island in the eastern Mediterranean. The population of the whole island is only a little over 1 million people, but apparently loosely governed with little wise leadership. To complicate matters, a Greek/Turkish conflict back in the 1970s has left the island divided into two camps. Hmmm, a parallel after all to the two Korea's? How does Germany come into this story? The banks of Cyprus have few controls, and after loaning out more than prudent in the past many years and being hit with the financial crisis of 2008 like many other countries, they (and the government) needed additional funds to cover lost investments and to pay liabilities. Like Greece, Iceland, Spain, and Ireland, they had overreached and needed a bailout. But instead of searching for legitimate monetary arrangements with the European Union, the banks tapped into an influx of funds from Russian tycoons (some say the mafia as well) to shore up their deposits. But the piper must be paid eventually, and now the EU's financial institutions are being asked to step in and stabilize the bankers indulgences, who have not been able to corral the Russian money in the country. Germany remains reluctant to once again send its own resources to rescue yet another Southern European country (Spain, Italy, Greece) that has not stayed within its means. From a BBC article "Germany's intent in all this is, at a textual level, clear: they want to avoid creating a moral hazard, rewarding a country that has sold itself as a rule-free playground for Russians who want to keep their money offshore." Before sending funds, Germany is asking for better banking controls and reforms. Some of the more inflammatory language actually came from Spain, whose citizens also are unhappy that Germany is demanding some fiscal responsibility. One Spanish newspaper compared German leader Angela Merkel to Hitler - not the sort of thing that Germans are at all ready to countenance. 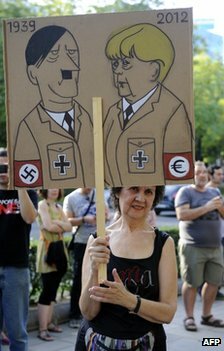 In Germany, any reference to Hitler is looked at seriously and unfavorably, The type of linkage expressed by this Spanish protestor in Madrid, is especially hard to take, considering Germany's past bailouts of several EU countries. As the article notes, "One young woman from Bavaria said: "When you see Greek people make that Hitler greeting, it's not good. It isn't allowed in Germany and it shouldn't be allowed in other countries. We are shocked. They are getting a lot of money from Germany so why don't they like us?" A middle-aged man said: "It's not okay when people say Adolf Hitler and Angela Merkel are the same. We live in 2013 and not in 1945." An older man said he did not understand why Germany was blamed for trying to help: "It hurts, because we think we are giving money and we try to help. This is something we don't understand." That sense of hurt is universal. Jan Schaefer, the economics editor of Bild, the most popular newspaper in Germany, told the BBC that pictures comparing Germany to the Nazi state were obnoxious." So, misunderstandings galore this week. End game approaches in Syria?